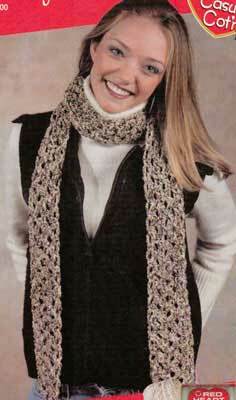 Scarf measures approximately 3 ½" wide x 66" long. RED HEART® "Casual Cot'n™": 4 Ounces No. 3463 Mushroom. Crochet Hook: 6mm [US J-10]. Yarn needle. GAUGE: 13 sts = 3 ½"; 8 rows = 5" in pat. CHECK YOUR GAUGE. Use any size hook to obtain the gauge. Row 1 (Right Side): Sc in 2nd ch from hook, [skip next 2 ch; (dc, ch 3, dc) all in next ch - shell made; skip next 2 ch, sc in next ch] twice; turn. Row 2: Ch 4, dc in first sc, sc in ch-3 sp, shell in next sc, sc in next ch-3 sp, (dc, ch 1, dc) all in last sc; turn. Row 3: Ch 1, sc in ch-1 sp, shell in next sc, sc in next ch-3 sp, shell in next sc, sc in ch-4 sp; turn. Rep Rows 2 and 3 until approximately 66" from beginning or until desired length. Fasten off. Weave in ends. ABBREVIATIONS: ch = chain; dc = double crochet; mm = millimeters; rep = repeat; sc = single crochet; sp = space; st(s) = stitch (es); [ ] = work directions in brackets the number of times indicated.